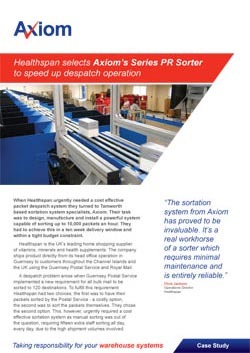 The PR (Pop-Up Roller) Sorter was developed in-house by Axiom as part of a project for high speed sortation of media, specifically DVDs. It is capable of handling products at a sort speed of up to 200 items per minute. 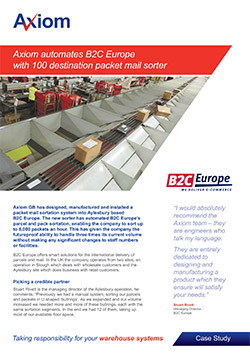 "The sortation system from Axiom has proved to be invaluable. It's a real workhorse of a sorter which requires minimal maintenance and is entirely reliable."